Re: TCombs UrS4, Brakes done, and wheel fell off..
Looks like the paint on the mating surface of the hat deformed and allowed the bolts to loosen. Definitely clean the paint off before the next install. I bet the other side is loose too. audifreakjim wrote: Looks like the paint on the mating surface of the hat deformed and allowed the bolts to loosen. Definitely clean the paint off before the next install. I bet the other side is loose too. That’s what I was thinking, it was either that or someone had messed with that wheel for whatever reason. The other side was tight. I got it on the rack last night. Looks like I just need a fender, brake rotor and custom rotor hat and small stuff, as well as a repaint on that caliper. All in all I got lucky with what happened. Probably the best case scenario for this bad event. I appreciate the kind words. This will stay in the back of my mind now when doing anything. I have emailed 2bennett, Apikol and ECS about that hats and I am waiting to hear back. Rotor is easy enough and the fender, I have found a couple on EBay. TCombs wrote: I'm in Oregon. Depends where at in Canada you are. Ha yeah, I say bro because he was just one of those guys who thinks he knows everything. Not someone I would ever take my car too. I did that as well when I put the brakes on. Only drove about 20ft and then I torqued them. I took the wheels back off and bled the brake system at work, and then once again torqued them. Not to sure about what happened. I'm in Nova Scotia near Halifax. At the start of your thread you mentioned you work at audi? I have a friend that manages the parts department at the halifax Audi location. Would you be able to do some sort of dealership to dealership shipping? The fender I have is white and actually was shipped to me from Texas lol. Let me know if I can help out. TCombs wrote: I have emailed 2bennett, Apikol and ECS about that hats and I am waiting to hear back. Rotor is easy enough and the fender, I have found a couple on EBay. If your having troubles with the custom rotor hats, I say skip them and go with the D2 A8 rotors (just a tad smaller 323mm) and call it a day. That's what I used on my very 1st UrS4. Here are a few pics of the 928GTS "big blacks" on my very 1st UrS4. Sorry the last 2 pics are small and hard to see the big blacks. If you zoom in you can see them. Bought D2 A8 rotors. They are just around 323x30mm. Which is what I thought, and everyone else has said. Went to put the rotor on and the caliper won't fit back on bracket. The rotor makes the caliper stick about half a bolt off, so it won't line up. SO back to the drawing board. I converted to studs in the front, and will do the back when I have more time, this being said I am just going to buy a new rotor ring and run the custom hats and a new rotor, while I still figure out the fender part. Got a couple of things in the works, just waiting on some cash, like everyone else haha. Unless I'm misunderstanding - You can just use a few washers to make up that 2mm to align it. I think he means the rotors are too large on the OD. Can they be manchined down to the correct diameter? DE80q wrote: I think he means the rotors are too large on the OD. Can they be manchined down to the correct diameter? Sorry guys, I didn’t explain that very well. The rotor fits pretty dang good. I was happy with it. It’s the actual hat on the rotor, I guess is just to “short” so the actual rotor pulls the caliper about 2-3 off center of the bolt holes when everything is installed. So the rotor hat on the A8 needs to be a bit “taller” to allow the caliper to be sucked in more (into the wheel well) so that the bolt holes line up. The rotor pulls the caliper out toward the wheel. 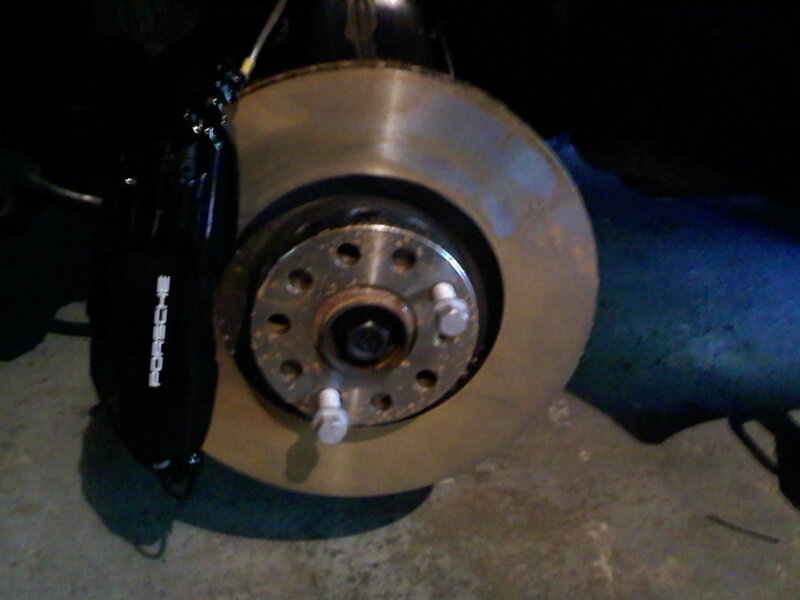 Or the brackets aren’t meant for these rotors. There is always the spacer option to fix that. That's what I had to do for the Porsche setup on a friend's 80q. Quick update. Got the new rotor on, stud conversion on all four wheels, and also got the fender off to see the damage. Looks like it’s just the fender which is good. Working on getting one of those here soon. Don’t think I will drive the car until I get a new fender on it though. Re: TCombs UrS4, brake rotor on, fender off. Maybe a sore subject, but what rotors and hats are you using? are you using Apikol brackets to run those 993 calipers? pilihp2 wrote: Maybe a sore subject, but what rotors and hats are you using? are you using Apikol brackets to run those 993 calipers? The rotors are from a 993 Turbo. 323x32mm or alike. I bought a two piece rotor from Autohausaz and just swapped hats over. The hats are custom. Still trying to find replacements for them. But no luck so far. 2bennett has some I believe but they are $$$. There is some great info on QuattroWorld. Let me know if that link works, if not just go to Quattro World and go the FAQ for the UrS4/6. Found an exhaust leak yesterday while I was cleaning some stuff up. It seems the gasket in between the down pipe and the cat has deteriorated. I have the Gen 4 Stomung, and need some help finding the right gasket. It’s a 3” with a two hole if that makes sense. I have done some looking around but can’t seem to find the right one and was wondering if anyone else had run into this and knew of a part number. Doesn’t seem like there Is much of a gasket left so I doubt taking one in will be much help, if there is anything to take in that is. Other decent option while it's apart is remove and install a V-band which will preempt future gasket replacement and make future access much easier. Well, after my order in July, I finally got my struts last week. Apparently they were back ordered from Bilstein and no one had them in stock. The rears werent that bad, I got those within two weeks. I also just got an install kit from Blau that comes with Front Strut Boots, Front Upper Strut Mounts, Front Upper Strut Bearings, Front Strut Bump Stops (Fits OE style struts),Front Suspension Strut Hardware Kit. The bearings are Meyle but I had done some reading before and bought the KYB one just to make sure everything works properly. Speaking of, I have done some research but I cant find out how to replace just the struts without removing the entire spring and everything else, or even if it is possible? Can I just remove the strut mounts and come out the top, or do I need to remove the entire assembly? I believe the rear is straight forward? Shouldnt have to remove much to get the shock out correct? Those come right out the top! Should be a write up on QW faq. Pics are fixed there now too! ringbearer wrote: Those come right out the top! Should be a write up on QW faq. Pics are fixed there now too! That’s what I thought but I must be blind or am just not understanding. I can find the thread about removing the entire assembly but nothing about just removing the strut from the top. Remove the strut nut, then strut mount. The gland nut that holds the strut cartridge in can be tricky but remove it and lift the strut up and out. I do it with wheels on the ground. Make sure inside the strut housing is clean and dry. Drilling a small hole in the bottom to drain any water is also a good idea. Good luck! Well, finally got my new struts and shocks in. I will need an alignment which I will probably do this weekend. It was quite a learning curve to get everything done. I had some help from a veteran tech who used to own his own shop. The front struts were difficult at first but I was able to get them out. The inside of the housing was full of rusty water, Made sure to clean that out. I didn't get a chance to drill a hole in the bottom because I couldn't lift the car up due to the spring possibly popping out and I didn't want to drill a hole with the new strut inside. I used blue loctite on everything and used a paint pen to mark the nuts to make sure they don't move, although I am going to have to loosen them to do the alignment anyway. The struts actually weren't that bad, but the top mount was horrible. It was able to move around freely. The rears weren't that bad. Pretty straight forward. A little sketched out using a spring compressor but I got them out and the new ones back in. The car ides awesome now. Much less vibration at idle. No noises over bumps.. for now. More driving will tell. Super happy so far. Although I wish I didn't have to wait six months to get the struts in. Re: TCombs UrS4, Struts and shocks in!! It's a Christmas miracle! Nice work. Be interested to hear how it feels after it's settled in and alignment is done. Got the alignment done tonight. I actually wanted to have a weekend and not have to stay late Friday or go in Saturday so I stuck it out and got it done. I have done a few alignments before but nothing on an older car. Rear camber was a bit difficult, trying to get your hands and a wrench up there to loosen and turn everything. Luckily the rear toe was fine. On the front the camber was super easy. 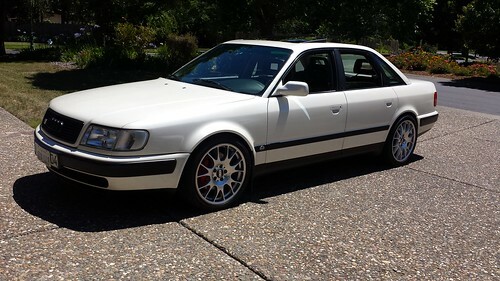 Wish the newer Audi’s were that simple. However the front toe was a bit more involved. It wasn’t even on the board before so having it show up pretty close is a win. It kept showing all good until i print the paper out then it went red, even though 10 is still good. These are specs from Hunter for a C4. If you guys have an input of what it should be let me know. Especially you track/AutoX/ Spirited Driver’s our there. Re: TCombs UrS4, Alignment done. Started the car after work today, and could tell something was wrong. The car was struggling at idle. It was vibrating super bad and the rpms were fluctuating, not by much though. Gave it some gas and it went away so I thought maybe it was just and oil pressure issue since it’s been pretty cold out. Drove maybe 200 ft and it started again. Limped it home, where it sits now. I haven’t changed plugs yet in this car so I should probably do that soon. This has happen once, maybe twice, if I remember right, a week or so ago when it was really cold. Gave it some gas and it went away. I’m hoping it’s not a fuel issue. I did change out my fuel filter a few months back but haven’t had any issues until now.